Are you already planning your logistics processes with a software solution and would like to increase its performance even further? Do you want to add functionalities to your commercial software solution to serve your customers even better? Integrate the PTV xServer software components seamlessly into your existing system landscape to solve optimisation challenges in transportation and logistics even more efficiently. PTV xServer covers a wide variety of use cases and requirements ranging from the display of mobile objects, route planning and fleet optimisation, to the exact calculation of driving and arrival times, toll costs and CO2 emissions. Choose the components that are tailored to your needs and combine individual components to build the tool you need. By working with our state-of-the-art software components, you increase cost efficiency and optimise logistics processes and, ultimately, secure a sustainable competitive advantage. 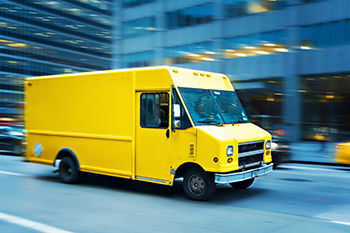 Dozens of delivery trucks, hundreds of orders, different priorities and time constraints: Planning delivery routes is a complex task that calls for deliberate advance planning. Optimisation and scheduling software streamlines this process and enables you to identify the optimal order of pickups and deliveries for your entire fleet. PTV xServer is the only software that considers rush hours and ongoing roadworks effectively already in the planning process. That way you can be sure that routes planned on the screen are also the best routes on the road. Our customers plan and optimise more than 30 million routes every day. With the help of PTV xServer, over 20 million locations are geocoded every day. Thanks to PTV xServer, our customers save up to 17% annually. This success is based on the trust that 5,000 customers have placed in us for 40 years. PTV xServer is based on a modular architecture. This means you can add geographical and logistical functions to your existing software solution that are tailored to your needs. The components are flexibly scalable and grow with your company. This guarantees optimal performance - regardless of the size of your system. Hence, deploying PTV xServer is a safe investment into the future of your company. Integrate the PTV xServer software components seamlessly into any existing software solution thanks to their standardised interfaces (e.g. REST). The components work in the background and do not need their own interface. Therefore, the new functions can be used on familiar interfaces and you quickly and easily gain user acceptance. Benefit from comprehensive documentation, code samples, webinars and the PTV xServer Developer Forum as well as personal advice: We support and train your employees during setup and the entire contract period. Managing transportation is complex. The PTV xServer software components combine precise formulas and algorithms with decades of experience in logistics and transportation that enable you to turn this complexity into efficiency: They cover all requirements of the transport chain, from order entry to delivery at maximum level of detail and performance. See how other customers and partners succeed with PTV xServer.